Unless you have someone supporting you financially or have been saving extensively, the cost of physician assistant school can be quite overwhelming. If you attend a public program, your debt won't be quite as much, but some of the private programs can cost over six figures just for tuition and fees without considering the cost of living. And most programs do not allow students to work during school, and it really isn't feasible with the intense schedule of PA school. I was really lucky to go to PA school where I grew up, so I lived with my parents the first year before I got married, which saved a lot of cost of living. They helped me out with fees and I covered all of the tuition with loans. I attended a public program so tuition was about $7,000 per semester. I also got a random scholarship that gave me $2,000 a year which helped as well. I chose to not look at any of my loans until the end of school and that number was quite shocking to me. I don't remember the exact number, but it was a little over $60,000. Now I realize that many people have loans that are WAY more than mine, but it was amazing to me how much interest can accrue over a short period of time, and it really got me motivated to getting my loans paid off as soon as possible, which I am currently working on. 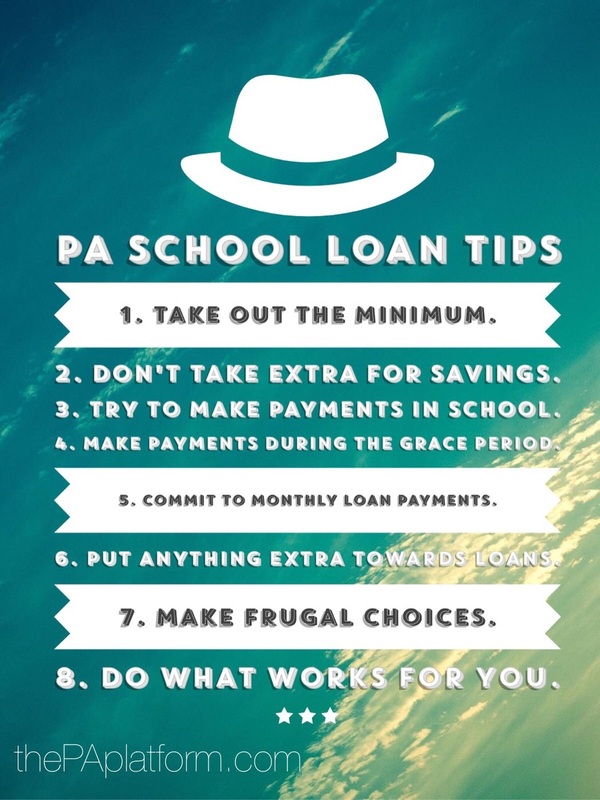 I'll share some ideas here on how to save money while you're in PA school because every little bit helps! I would also advise only taking out the minimum that you need because if you have the money in reach, you're more likely to spend it. 1. Find roommates: Whether it's your parents or classmates, you'll find cheaper living options if you live with someone else. A one-bedroom apartment is typically much more than a 2 or 3-bedroom. Whenever you find out you're accepted, usually there's a Facebook page where you can connect with other students and see what their living situations are. If you're in class together, you can carpool as well or split a parking pass! 2. Bring lunch and don't eat out: There were so many of my classmates that would eat out for every meal, and those costs can add up quickly. You definitely have to eat and want to be healthy if possibly, but packing a lunch will save you some money in the long run. If you currently eat out a lot, look at your food costs for one month, and then try to eat out less for the next month and compare. As much as I love to save money, I'm also support splurging occasionally on meals or events, so if you're saving money on lunch each day, you won't feel as bad going out to eat with your class or going on a date night! 3. Avoid online shopping during class: I know this one from experience actually! One of my good friends sat beside me in class and there would be times that one of us would find something really cute or a really great deal online and if she bought it, I would just get her to throw one in for me too, or vice versa. It saves on shipping right? I'm all about a good deal, but I also make the occasional impulse buy. If you like to shop for clothes, you could try Stitchfix because they have a great referral program and if your friends sign up you get a 25 credit. 4. Referral Programs and Surveys: You won't have a ton of extra time in PA school, but there are some survey sites where you can actually make a little money. Swagbucks is a really easy one to use, and I don't do it quite as frequently, but I've gotten over $200 in Amazon gift cards over the past few years, and that really comes in handy! As for referral programs, if you are purchasing something see if they have any kind of program. Sites like Groupon and LivingSocial will have deals, such as if 3 people buy the same deal you got with the link, then you get it for free! 5. Make money! : If you have any extra "stuff" think about selling it on eBay or another resell site, like Craigslist. There are multiple "Garage Sale" Facebook groups in our area, which are a great way to sell things locally and find good deals. If you have extra clothes, there's Poshmark online or Uptown Cheapskate or Plato's closet, which will pay you for clothing. 6. Use coupons: I'm not talking about extreme couponing, but if you want to do that then go for it! Using coupons occasionally can help you to save some money though. Kroger and other grocery stores have some great apps now that you can add coupons to. You can also use Groupon and LivingSocial or Restaurant.com to find deals on gift certificates to restaurants to eat out. If you use this link to LivingSocial you'll get $10 off of a deal that's at least $20. 7. Textbook alternatives: Whenever we got our textbook list, I would always check to see if there was an online copy for free either as a PDF or app. Our library provided some great access to textbooks online. I personally like to have the physical books, so the best places to check for this are Amazon or eBay, or with the class above you to see if they are willing to sell. I think it makes much more sense to purchase the book and then sell it to another student or to Amazon's Trade-in program than to rent the books. Amazon is amazing, and as a student you can get a great rate on Amazon Prime, which includes free 2-day shipping on most items and a ton of music and videos as well. With this link, you can get a free 30-day trial! 8. Scholarships: Make sure to check and see if there are any scholarships offered by your school, and if they have any financial aid survey, fill it out! The scholarship I received was called the Lettie Pate Whitehead Scholarship, and I got it just because I filled out the survey and qualified. I think some of my classmates could have received it as well, but they just never looked into their options. Here is a post with a good list of scholarships! 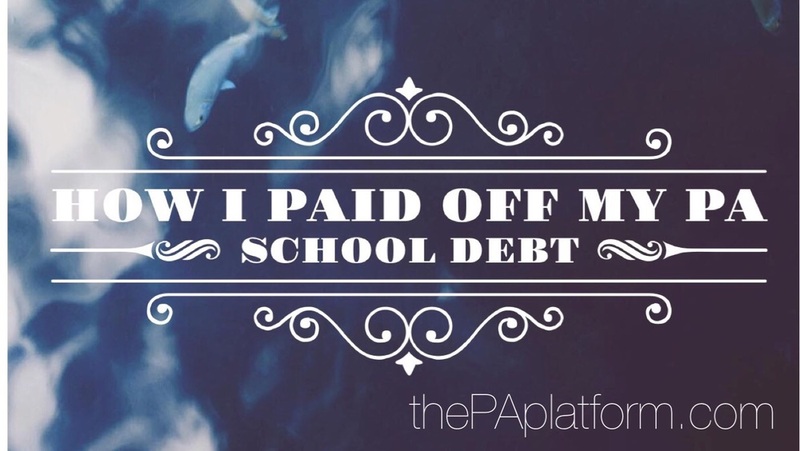 Here is a blog post with some other tips on how to afford PA school as well. I hope you found some of this a bit helpful, and if you have any other tips please comment below!